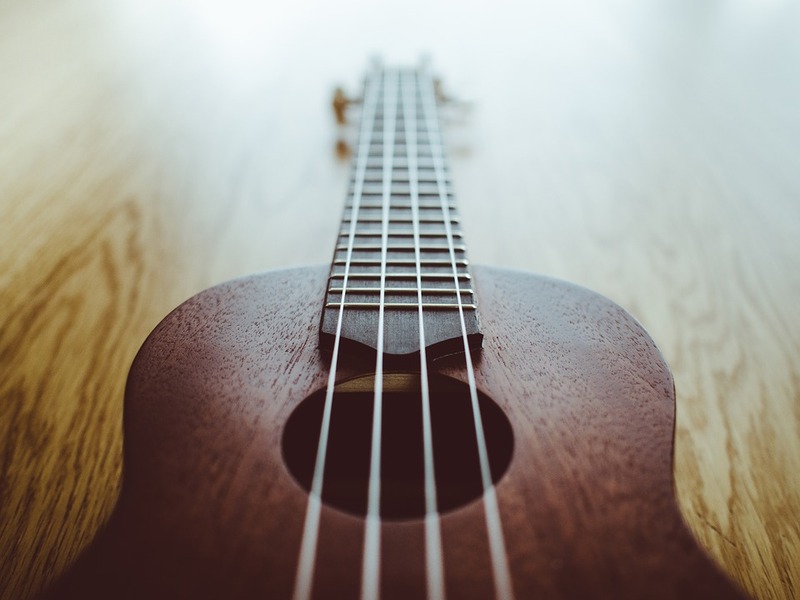 The ukulele is a popular Hawaiian instrument that offers portability, plus gives you the feeling of relaxing, carefree on a beach somewhere. Doesn't that sound magical? This guide to ukulele for beginners covers the basics to learn how to play the ukulele and build your skills. First you'll want to put some money down on a good uke, like the Luna Mahogany Acoustic-Electric. A quality instrument may cost you more now, but in the long run it will save you the headache. I would dissuade anyone from buying a ukulele under $50. A good ukulele will be easy to keep in tune and you'll create better sounding music. Just because the ukulele sounds like you should be on vacation in Waikiki, doesn't mean it's an easy instrument to play. You'll need to dedicate time to learning the ukulele. It will take hard work and practice to master this instrument. ​How do I hold my ukulele? First off, how you hold your uke depends on whether you are right-handed or left-handed. If you're right handed, you'll strum the strings with your right hand and hold the neck if the ukulele in your left. The opposite goes for lefties, strum with your left and neck in your right. ​Look at the image below to see how to hold the ukulele while sitting. Lorraine, from Waterstones, demonstrates how to hold and play your uke in this video. The instrument itself is pretty light and easy to manage, but you may find it easier to use a strap. Using a strap can create more space between yourself and the ukulele to ensure sounds aren't muted. ​How do I strum a ukulele? After following the tips to properly hold the ukulele, you are ready to make some music! If you have previous experience with playing the guitar, this may be a little different and take time to get used to. First, create a loose fist with your strumming hand. On your down strokes, the fingernail of your index finger should be hitting the strings. When you strum upwards, the pads of your index finger should be hitting the strings. Usually, when guitar players learn how to play the ukulele, they want to strum down with the ​nail of the index finger and continue to strum up with the thumb. We want to keep to keep all the strumming to the index finger. Focus on moving your wrist, instead of your entire arm. This will save you energy and prevent fatigue when you're playing for hours on end. Keep your strumming in the center of the ukulele. This is usually where the neck and the body connect. If you strum too high on the neck, or too low by the bridge, you won't get the dulcet sounds. One thing to mention, on tenor ukes it's best to strum closer to the bridge of the guitar. On soprano or concert ukes, you'll keep it in the middle. ​What about different strumming patterns? You don't always have to strum up, down, up, down repeatedly. Don't be afraid to stray from the vanilla. You can switch it up and be creative with your strumming. Practice strumming in different patterns. For example, you can strum down, up, up, down. Or, skip hitting the strings on your up and down strums. Strum up, miss the down strum, strum up, strum up. After you've mastered the basics, learning different strumming patterns like swing/shuffle strums, chunking, or dead strums. It's difficult at first to get your rhythm perfect, especially while focusing on playing different notes and chords. Don't get frustrated though! As the chords come more naturally to you and you are able to transition between finger adjustments seamlessly, you can begin to focus on your rhythm and timing. Start out with a slow and steady rhythm. Trying to play fast will only cause you to make mistakes. It's exciting to play fast, but even Jeff Gordon had to learn to drive a car before he could hit the race track. If you find yourself still having trouble, consider getting a metronome to pace your strumming. This gadget makes click noises at an adjustable, steady rate for you to match as you play. Once you begin to master your posture, ​strumming, notes, chords, and rhythm, you'll be ready to learn entire songs. I suggest making a goal for yourself to practice 20-30 minutes every day. This is enough time to play during the commercials of your favorite hour long television show. With practice, you'll be a master in no time. For any pint-sized players out there, check out Ukulele Kids! It's an inspiring after-school program to learn the ukulele! If you need a little inspiration, check out Jimmy Stafford. He's the ukulele/guitar player in Train. Below is an acoustic, live version of their song "Hey Soul Sister." Next articleTypes of Ukuleles, Find the Uke for You!